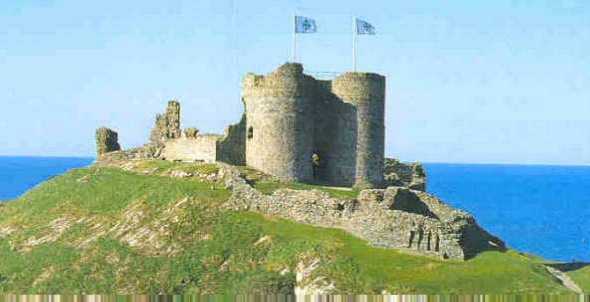 Criccieth Castle, standing on its headland between two beaches, is a prominent North Wales landmark. It is also a landmark historic site, one of those rare castles with a foot firmly in both camps and a true testament to the varying fortunes of war. Criccieth's history is deeply entwined in the medieval conflict between Wales and England. Originally a stronghold of the native Welsh princes, Criccieth was later annexed and added to by the English monarch, Edward I. Both sides obviously had a high regard for Criccieth's strategic siting, on a rocky peninsula overlooking Tremadog Bay. The core of the castle (a powerful twin-towered gatehouse) is Welsh, built by Llywelyn the Great probably between 1230 and 1240. 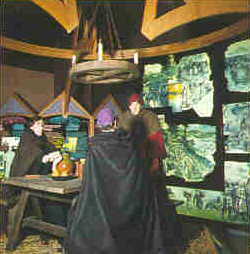 The gatehouse is unique amongst Llwelyn's castles, he may well have copied an English model and even used expert masons familiar with the style. The castle was taken by Edward's forces in 1283 and extensively refortified, which included adapting a tower for use by a catapult or stone-throwing 'engine'. The improvements were put to the test a decade or so later when the castle had to withstand a long siege by the Welsh, during which supplies were brought in by ship. Its fate was finally sealed in 1404 when the Welsh leader Owain Glyn Dwr captured and burnt the castle (even today, the walls still bear evidence of scorching). Criccieth's convoluted history, part Welsh, part Edwardian, gives it a character rare amongst the castles of Wales. Its romantic ruins have attracted artists like JMW Turner, who used the castle as a backdrop for his famous painting of storm-wrecked mariners. Monday to Thursday free entry. Access:- A497 to Criccieth from Porthmadog. Admission Charge:- Adults £3.50, Reduced rate £2.50. Family Ticket:- £9.50 - admits 2 adults and up to 3 children under 16 years.